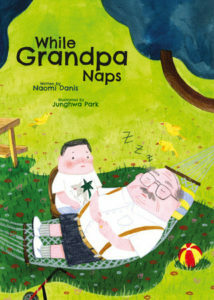 Several decades have passed since I encountered an All-of-a-Kind Family book for the first time. The newest installment looks different (as do I), but our reunion was sweet. 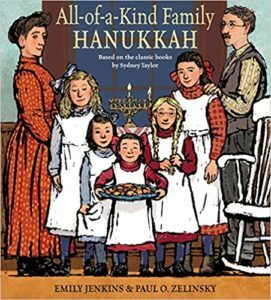 All-of-a-Kind Family Hanukkah (Schwartz & Wade, $17.99) follows the youngest sister of five, Gertie as she tries to help her sisters make latkes. The book is unlike Sydney Taylor’s original series in striking ways: author Emily Jenkins uses the present tense to convey a young child’s sense of immediacy, and Paul O. Zelinsky’s bold and tender color illustrations look nothing like Helen John’s original detailed ink drawings. Still, the characters were immediately recognizable, and the book retains the series’ essential New York-yness. Reading it, I was filled with the cozy longing the series has always triggered in me. But I was also a kid, and kids have different relationships to their favorite books than adults do. Nothing I read today could ever capture my imagination the way the books I loved as a child did. That’s the consuming magic of childhood, the endless fascination we have with our favorite things. So, no literary feast can match the All-of-a-Kind Family episode in which Charlotte and Gertie amass a hoard of chocolate babies and broken cookies, then devour them in their bed after lights-out. As an adult, it’s hard to find the room, or time, to enjoy this kind of extended imaginative experience. That’s probably just as well, since the idea of buying huge quantities of sweets for only two cents (the enduring fantasy of my childhood, and one that is slyly referenced in All-of-a-Kind Family Hanukkah) doesn’t have quite the same appeal today. Alas. My three-year-old is too young for All-of-a-Kind Family Hanukkah, but he does love books about New York City. So I’ll show him the pictures of Gertie and her sisters in the hopes that he, too, will one day be captivated by the adventures of his fellow New Yorkers, the All-of-a-Kind Family. Elizabeth Michaelson Monaghan is a former Lilith intern and native New Yorker. Her work has appeared in City Limits, Paste, and McSweeney’s Internet Tendency. Who would have thought that children’s books about the Holocaust would become popular with kids? But even Wolfe was surprised at what followed. “We always assumed the first one would be a one-o ,” she says. The Secret of Gabi’s Dresser, intended for 9- to 12-year olds, was published 20 years ago. “It’s based on the true story of a child, the author’s mother, in Czechoslovakia. When the Nazis came to collect Jewish girls, she was hidden in a dining room dresser and was saved.” Wolfe recalls, “My sales reps, who are commercial sales reps, thought they’d humor me. ‘Oh, Margie wants to do this, we’ll sell it to a few Jewish bookstores and that will be the end of it’.” But it was only the beginning. The author of Gabi, Kathy Kacer, wrote more award-winning books for the series. And then, said Margie, “there was our ‘miracle book’: Hana’s Suitcase,” published in 2002. This is a true story about a woman who travelled from Japan to Canada to meet the brother of a child killed in the Holocaust. Hana’s Suitcase is Canada’s most honored children’s book, ever. It has been translated into dozens of languages, and is still popular and still winning awards around the world. But what is most important to Wolfe is that “it revolutionized what it was possible to tell kids at a young age. Second Story Press has become a magnet for writers from all over the world who want to submit Holocaust books for children. Wolfe is very clear about what she will publish. For example, she flatly rejects pitches where the characters are rep- resented by animals. That history is also Margie Wolfe’s history. She was born to survivors in the displaced persons camp at Bergen-Belsen, and came to Toronto as a very young child. Her rst job was with The Women’s Press in Toronto, and she’s proud of being a feminist publisher for the last 40 years. She founded Second Story—the official name is Second Story Feminist Press—with three other women; she later bought them out. “Anything I do is informed by feminism,” she explains. “It’s what I bring to whatever kind of book that we do.” Her list includes fiction, nonfiction and biography for children and adults. A book she describes as “Thelma and Louise but better, about two women with mild Alzheimer’s” who find an offbeat way to maintain their independence, won Canada’s prestigious Leacock award for humor. And then there’s a Gutsy Girl Series, and I’m A Great Little Kid picture book series for ages 5 to 8, a mystery series for teens, a First Nations Series for Young Readers, focusing on indigenous peoples in North America, which has garnered many awards and is popular in U.S. school libraries, and even a children’s book about euthanasia. New releases this year include Black Women Who Dared, for children 9 to 13, The Story of My Face, about a girl scarred by a grizzly bear attack, recommended for ages 13 to 17, and a novel for adults about two Winnipeg sisters haunted by their childhood in Russia. But for all the eclecticism in the lineup, Second Story sticks to its mandate to publish books by Canadian authors that pro- mote feminism, social justice and Judaica. “We did the first collection of Yiddish women writers in translation back in 1995,” Wolfe notes. JUDY GERSTEL is a Toronto-based freelance journalist, formerly a critic and editor at the Detroit Free Press and Toronto Star.